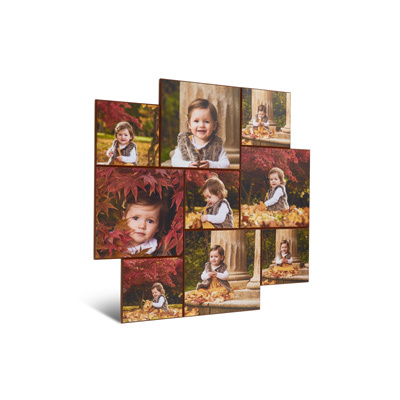 Sizes Available From 32x8.6" to 27x27"
Your images are printed photographically, sealed and set onto 18mm Beveled Edged MDF panels of various sizes before attaching to one another via a back plate to create a conjioned effect. Available in four mosaic style combinations as well as three edge colours; Black, White and Mahogany. Mosaic Bevel Print Blocks are available to order online directly through this website using our wizard. Choose between the following three edge colours.